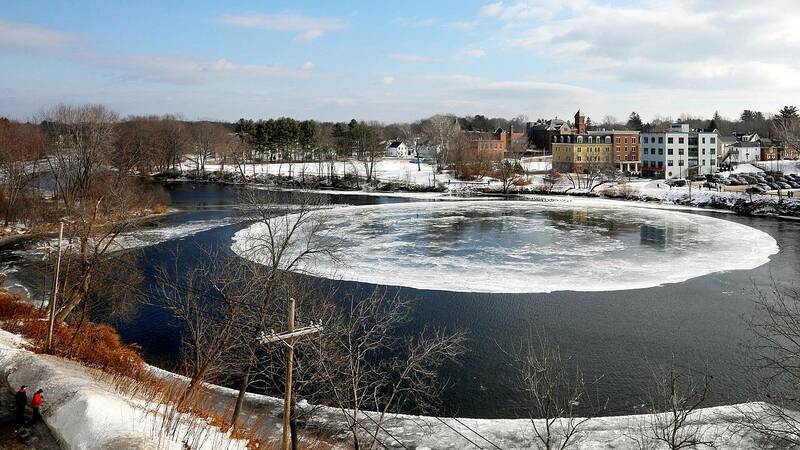 Aliens didn't create this weird swirling disk in a Maine river. Here's what did. A huge, spinning disk of ice that formed on a river in Maine this week has some people online joking that it was made by extraterrestrials — possibly as a landing site for their spacecraft. "Oh no! The world is coming to an end," one commenter said on Facebook. But experts say the real explanation for the odd formation is more down to earth. The massive disk on the Presumpscot River in Westbrook, a suburb of Portland with a population of about 17,500, is simply a chunk of river ice whose sharp edges were rounded off by repeated collisions with the shore or floating debris. Ethan Gutmann, a hydrologist at the National Center for Atmospheric Research in Boulder, Colorado, said such icy disks can form when a block of river ice breaks free and gets caught up in spinning currents. "It gives the block of ice a push in this circular motion, because underneath it on one side, the water is flowing faster, and on the other side, it might be flowing slower or even upstream," he said, adding that as it is spun around, "eventually you get something very close to a perfect circle." The disk is about 300 feet across and appears to be spinning counterclockwise, The Portland Press Herald reported. The same phenomenon has been found elsewhere in the U.S. and around the world, including in Michigan and North Dakota. "I suspect these occur more often than we think, but it's relatively uncommon to see this form right in a city like this," Gutmann said, adding that the one in Maine is one of the biggest he's ever seen. The disk has been a sensation in Westbrook as well as online — not just with people eager to see the odd formation before it breaks up, but also with local wildlife. "There were ducks sitting on it," area resident Rob Mitchell told the Press Herald. "The ducks were rotating on this big Lazy Susan. It was a big duck-go-round." The fate of the disk depends on Westbrook's weather in coming days. If it stays chilly, the disk may persist or lose its circular shape as more water around it freezes over. Warming weather, on the other hand, would cause it to disappear altogether. "Eventually, pieces of it will break off and flow downriver," Gutmann said, "and it will cease to exist." Plant scientists have found a way to 'hack' photosynthesis. Here's why that's a big deal.